The Alhambra is one of the most romantic sites in Europe. Perched on a high foothill of the snow-capped Sierra Nevada mountains, it overlooks the city of Granada in the Andalusia region of Spain. Tall trees and woodland surround the complex. 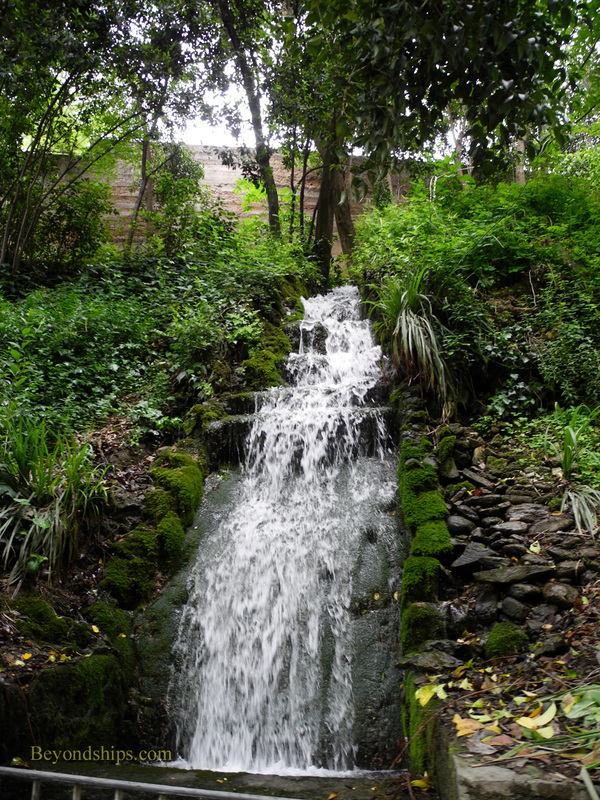 Water from the mountains has been channeled to make lush gardens, which complement the fine examples of Moorish and Baroque architecture that lie with in its towering walls. It is not surprising that the Alhambra has been the inspiration for writers and poets down through the centuries. 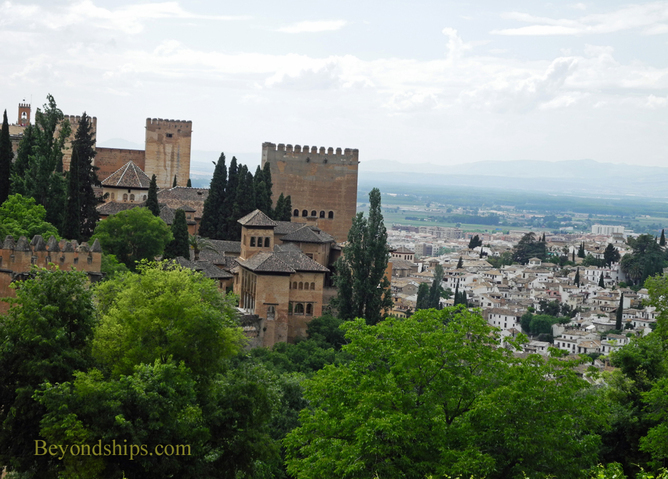 Although the Alhambra is located inland, cruise travelers can visit the Alhambra during port calls in Malaga. Indeed, some cruise ships offer organized shore excursions from Malaga to the Alhambra. Nearly five hundred years later, the Alhambra's role changed to that of a fortified royal palace for the last Moorish rulers of Spain. Yusaf I, Sultan of Granada, (known as “Alhamar”) began construction of the first palace within the defenses of the Alhambra. His successors in the Nasrid dynasty continued to add on and expand the royal palace. Since this was a period when Christian forces were attempting to drive the Moorish conquerors out of Spain, high walls and defensive towers were also constructed. 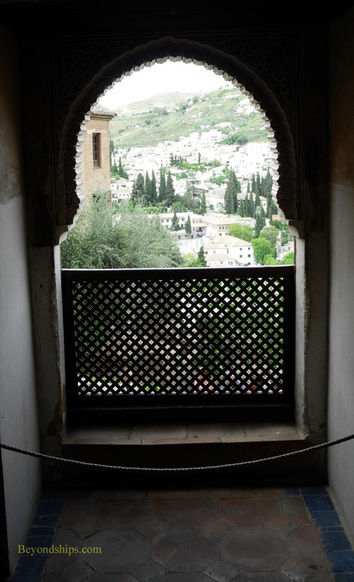 The Alhambra became a refuge for artists and intellectuals fleeing the fighting. However, in January 1492, the Sultan Muhammed XII (also known as “Boabdil”) surrendered the Alhambra to the Christian monarchs Ferdinand and Isabella thus ending eight centuries of Moorish rule in Spain. At first, the new owners were quite taken with the Alhambra. Ferdinand and Isabella made extensive repairs. Their grandson, the Holy Roman Emperor Charles V, ordered that a new modern palace be built. Construction began in 1533 but was never completed as the court became established in Madrid. Subsequently, the Alhambra was left to deteriorate. 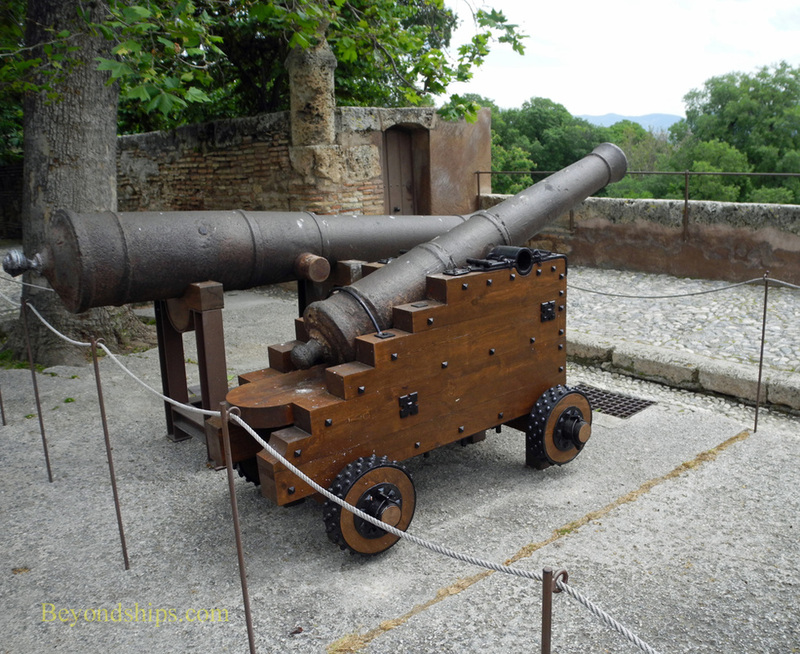 During the Napoleonic Wars, it was used by the French in their occupation of Spain. As they withdrew, large sections were mined and left in ruins. Later in the 19th Century, however, writers such as Washington Irving, began to draw public attention to the Alhambra. In 1870, the Alhambra was declared a national monument and restoration efforts began, which continue today. In 1984, the Alhambra was declared a UNESCO World Heritage Site. Right: The Alhambra continued to have strategic value after the Reconquest. Indeed, it was used as a military facility as late as the Napoleonic Wars. 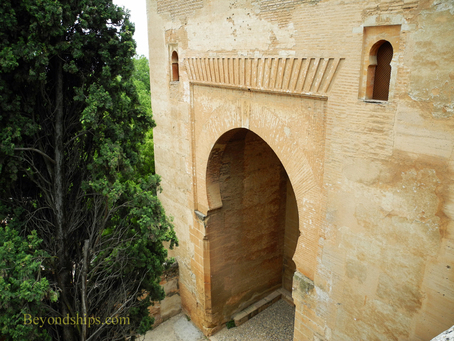 Above: The Justice Gate, built by Yusaf I, was the official entrance to The Alhambra. Below: The Moors channeled water to the site both for practical purposes and so that water features could be created for aesthetic purposes.